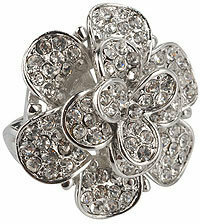 This Clear Crystal Flower Ring by Chanel may be rented from Avelle.com for $43 per week. I don't know the exact retail price of the ring but it's Chanel so you know it's up there. While Chanel-inspired rings can be found just about everywhere, this particular crystal flower ring currently available at Forever 21 seems to be an especially charming homage. For $6.80, how can you resist? And the winner is… Michel Reid of Sunrise, Florida! Congratulations to our winner and a big thanks to Baghaus for providing the prize. Start the New Year with a new handbag! We've teamed up with Baghaus.com to offer one lucky Budget Babe reader the chance to win this Urban Expressions "Constance Tote" (approx. value $68.95). Made of high-quality synthetic leather, the Constance Tote features gold tone hardware, signature striped lining, and multiple exterior and interior pockets. Measuring 17.5" wide x 13.5" high x 6" deep, the Constance is the perfect size for toting all your essentials. This giveaway is open to both United States and Canadian residents. Yippee! Entries must be submitted by Tuesday, January 12 at 12 noon ET to be eligible to win. Winner will be announced Wednesday, January 13th. The Pour La Victoire Pascale High Heel Woven Sandal in black as seen on Ashley Tisdale is now on sale for $189 at singer22.com. For a budget-friendly alternative, pick up the Zigi Soho Magdalena Braided Woven Platform, now $49.94 at dsw.com. My sister has these and I want to steal them! So hot.